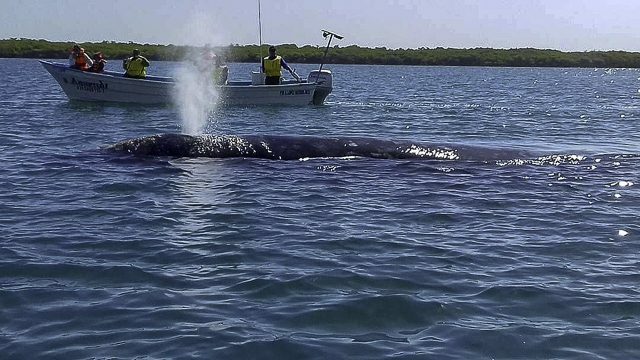 Discussion in 'Baja Bytes By Gary Graham' started by Baja Bytes, Feb 4, 2019. 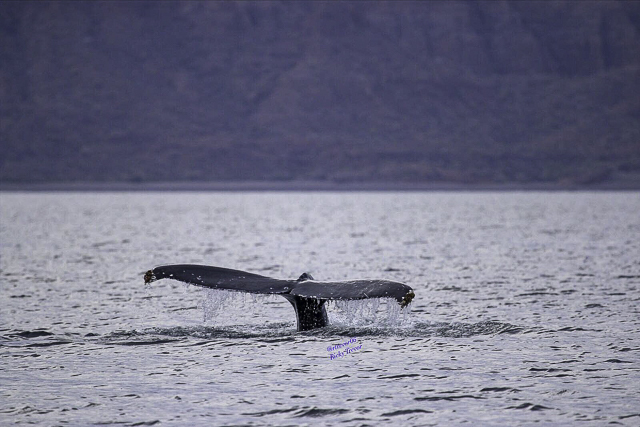 Los Cabos sportfishing shines, while the northern areas along the Pacific side and up into the Sea of Cortez are still facing winter conditions, resulting in few fishing trips. Offshore at Los Cabos, it’s business as usual! A mere handful of miles off the tip, the volume of stripers grow as they continue their annual slide south, accompanied by yellowfin tuna and dorado. The crew from El Pescador Fish Market are back for more! Capt. Christian Catianput the guys on the winter trifecta — yellows, reds, lings. Not the numbers like earlier in the week, but a better grade. Red crab float is thick around the reefs as well, but most fish are in the 160- to 200-pound range. Nice mixed bag … stoked!…Kelly Catian. 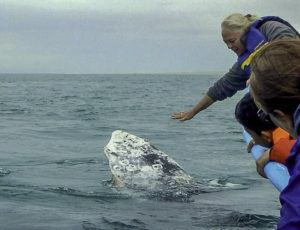 whales today but difficult viewing conditions; however, one friendly whale made it all worthwhile. The La Mar Laguna Marina Eco-tours team welcomed us at the remote Whale Camp for a fantastic lunch; the chef prepared chocolata clam ceviche, fresh lobster accompanied by shrimp and corvina — a seafood feast to be sure! They are building a fantastic new dining room with a wrap-around deck for great whale viewing and perhaps some music and dancing after a hard day of whale watching. It’s the beginning of the formal winter yellowtail season and most of the Loreto boats are working. They are back out soaking bait down deep at the 50 Spot and Punta Lobo off Carmen Island. Twenty-five-pound yellows are the target in at least 100-feet deep “high spots.” Baquetas are on the “wish list” out there as well, but hauchinango are the ones showing up at the end of the hook. While we are discussing the “hook end,” some of our captains are crying about some shiny, silver-colored circle hooks that the boss broke out to use. 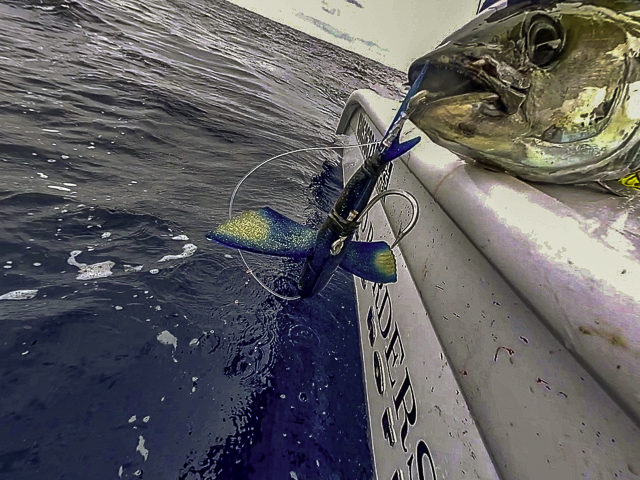 The captains claim that shiny hooks are getting ignored by the yellowtail, costing hook ups! The moral of that story: use bronze or anything dark! I don’t know about the science behind that but I always pay attention to third- and fourth-generation local fishermen, and I always keep an eye on them anyway to see what they do, so why not listen to their wisdom! Whale watching season heating up at Lopez Mateos! 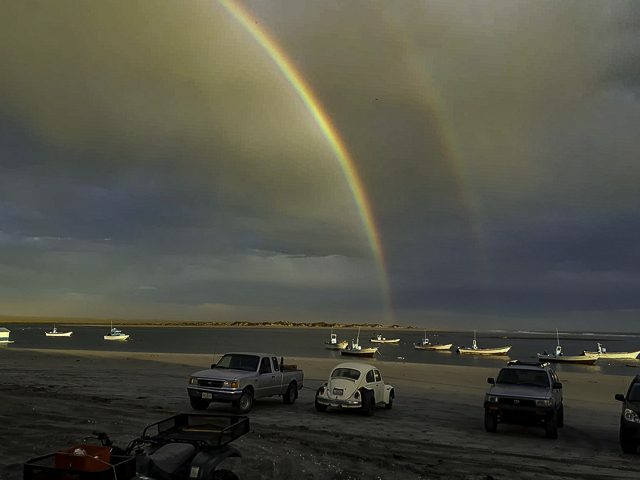 The Van Wormer Resorts have been icons of Baja California’s East Cape for more than fifty years. 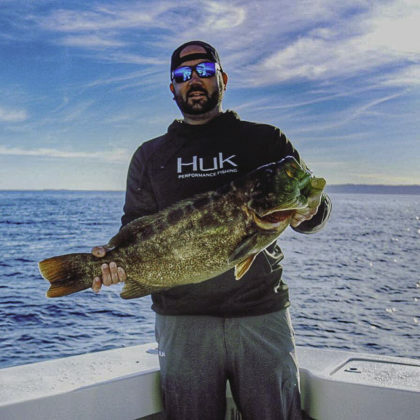 This week on Angler Chronicles, Hotel Boutique Playa del Sol, Los Barriles, is the resort of choice as Sergio and crew cover the annual Fishers of Men West Coast Tournament. This is a fun tournament that raises much-needed funds for charitable events sponsored by Fishers of Men West Coast, including the huge “Casting4Souls” shoe giveaway every October. Sergio, along with Ron Hobbs, Larry Moore, and Jack McCulloch, Jr., all take an active part in this very worthy event. 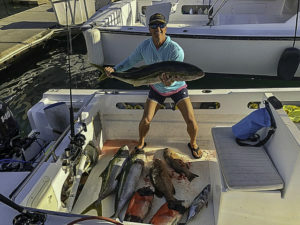 The fishing is terrific, as always, in the Sea of Cortez as the Angler Chronicles’ crew catches a host of game fish, including quality yellowfin tuna, wahoo, roosterfish and dorado. Lots of bent rod action in this week’s episode. Don’t miss “Fishers of Men 2018!” … It’s great family entertainment! Striped marlin action is now heating up off the San Jose del Cabo area, anywhere from three to five straight out from the marina. This is where schools of mackerel and sardineta are congregated, attracting good numbers of billfish. Many charters are drift fishing bait, down deeper where the stripers are feeding. There have been some surface action as well. 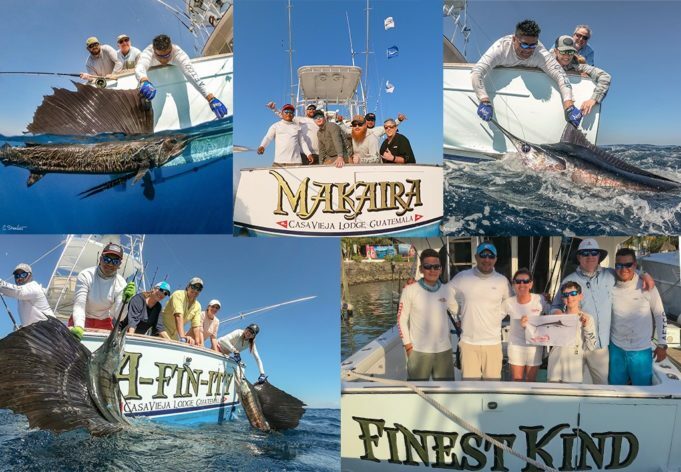 Many boats reported multiple chances for marlin, ranging in size from 60- to 100-pounds. A few dorado were also coming from these same grounds. Water temperatures have been in the 70- to 75-degree range, with fluctuating currents moving in and out. Other bait options in the marina have been caballito, ballyhoo and squid. Also, many of the super panga charters are catching their own chihuil on the Inner Gordo Bank, where there has also been quality-grade of yellowfin tuna holding. 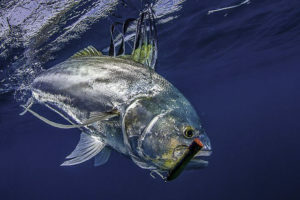 Although the bite has been sporadic, every day we are seeing a handful of these tuna in the 60 to 100-pound class accounted for by the combined fleet. Anglers have been having success drift fishing with strips of squid, as well as on chihuil. 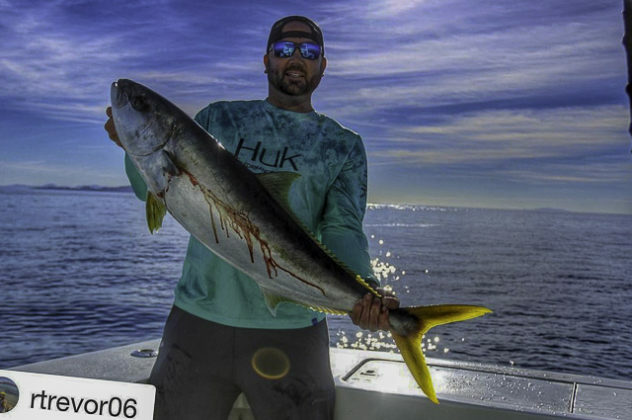 The action closer to shore off Punta Gorda had faded out, but this week the action rebounded for both wahoo and dorado. 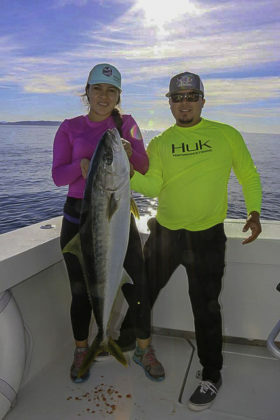 The key was to use the live chihuil for bait, slow trolling within one mile of the point; although it was still hit or miss, some boats did account for multiple wahoo as well as dorado. Wahoo were of mixed sizes, some less than 10 pounds, some near 50 pounds. Most of the dorado were in the 5- to 15-pound class, with a few pushing 20 pounds — good action considering that we are now in the winter season and these species are not a normal catch for this time of year. Bottom action has remained spotty — more triggerfish and small snapper than anything else. Some commercial pangeros had connections for imported red crab and they reported some nice hauls of red snapper. Maybe we will start to see crab on our local grounds, the best bait for snapper action. This coming month, we normally begin seeing more consistent activity for nicer-sized fish off of the bottom structure. We are all hoping for improved yellowtail migrations this season. We decided to do a little crew/friends tuna trip and landed lots of tuna. No big ones but still had lots of fun. We put the kite up for a while and got a bite or a fish about every pass we made through the school of tuna. We tried five different styles of flyers and the tuna destroyed every one. More multiple fish days reported throughout the fleet and the action was again mostly close in. The dorado counts were down substantially this past week, however. The yellowfin tuna counts continued to be good for the second week in a row, although the fish were a bit more scattered. The striped marlin fishing continues to produce excellent results overall on the Pacific side with fishing continuing to concentrate from around the Lighthouse out to the Golden Gate. The fleets reported exceptional counts of striped marlin with most boats averaging 2 to 3 fish per day. 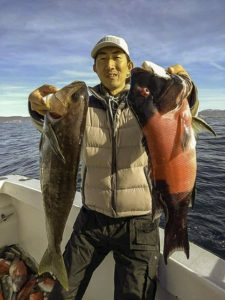 The yellowfin were again showing in the 25- to 30-mile range to the south and southwest and also off the Golden Gate; the key was to find the pods of porpoise and you most likely would also find the tuna with most averaging in the 30- to 100-pound range this past week — some up to 175-pounds. Inshore fishing has continued to produce nice catches of schools of skipjack with the sierra showing in good numbers from Solmar to El Arco. Roosterfish are occasionally showing in the surf from Solmar around the point at the Lighthouse and in the Palmilla area. Cabo Climate: January has had very pleasant weather with a mix of mostly sunny to partly cloudy skies with the outlook for average daytime temps in the upper-70s and evenings in the low- to mid-60-s. Good news is in the forecast for mostly sunny to partly cloudy skies with zero chance of rain through mid-February. Winds are expected in the gentle 8- to 10-mph range through early February, mostly out of the West and SW. Humidity is expected to run in the low to upper-60s into mid-February. Sea Conditions: Seas have been relatively calm in the mornings throughout the area with some swells and chop showing up in the afternoons as breezes increase. Forecast is for more of the same with winds in the 8- to 10-mph range from the West and SW. Sea temps have cooled but stabilized and are running from 73 to 76 degrees on the Pacific side and a bit cooler in the 72- to 74 degree range on the inside around the Gordo’s. Best Fishing Areas: The marlin hot spots have remained to the west and north. The Lighthouse area was a major hot spot again this past week. Most of the fish are being found 1- to 8-miles out from shore. Large numbers of stripers are showing in the Golden Gate area. The yellowfin are being found 25- to 30-miles out to the South and SW near the Herradura, 110-, 120-, 180- and 200-Spots. 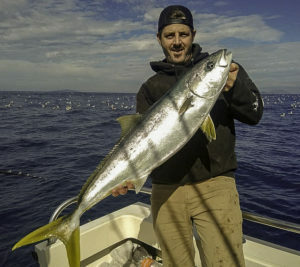 Good counts of quality yellowfin were also coming off the Golden Gate area and some yellowfin up to the 100-pound mark were reported around the Gordos. For those willing to make the longer 50-mile run, the Finger Bank has continued producing double-digit striped marlin counts. Traffic is lighter up there recently as the fish counts closer to home increase. Favorite Baits: Trolled blue/green smoke trail lures along with live mackerel or live cabillito were the favorite for the marlin. Soaking live bait around the Finger Bank and off the Lighthouse area produced successful multiple striper counts. Trolled feathers and cedar plugs were the ticket for the yellowfin. Hoochies were by far the preferred and most productive lures for the sierra. Poppers near the surf were the most successful bait for the roosterfish. GREAT REPORT as usual keeping me going. More heavy rain in the OC, day 5. TheGunslinger and Baja Bytes like this.